We photographed the second-generation Fiat Fiorino pictured below last week on the island of Sardinia. It was sitting in a disaffected parking lot in Olbia, one of the biggest cities in the northern part of Sardinia. We can’t tell exactly when the Fiorino was built but the front end tells us it was assembled between 1987, when the second-gen Fiorino was introduced with a Uno-inspired front end, and 1992, when the van was given a facelift that brought a more modern looking front fascia that borrowed styling cues from the second-gen Uno. The van is actually relatively complete. It is only missing both rear doors, the windshield and minor bits and pieces like the radiator grille and the tail lamps. The interior is untouched – there are even cassette tapes on the dashboard – and all mechanical components are still accounted for. 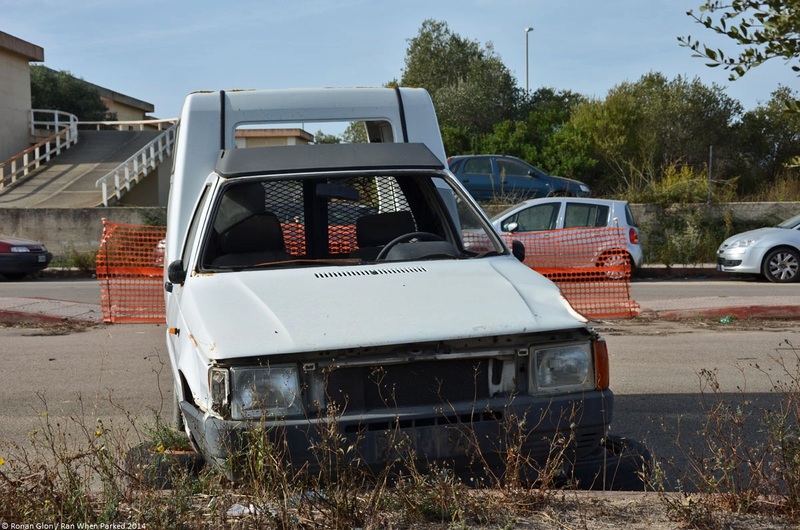 How the Fiorino ended up in a parking lot in Sardinia is anyone’s guess. The registration number was issued in Pisa, in the north of Italy, so odds are it was brought to Sardinia by an artisan of sorts. The owner abandoned it locally after it broke down and took either a plane or a ferry back home. Local residents likely started stripping parts from it after they noticed it was abandoned. The Fiorino was distributed in many countries across Europe but it has become a fairly rare sight outside of Italy. In its home country it’s been the de-facto small van for decades and the second-gen models are still very common, but the early 127-based vans are somewhat hard to find in clean shape. It seems like that one was built in Brazil.